Together, we are leaders in collegiate recreation. Help NIRSA stay ahead of the curve when it comes to current trends. NIRSA’s “Emerging Trends Panel”, presented at the NIRSA 2017 Annual Conference, will provide an in-depth discussion of an identified trend in the field of collegiate recreation. Through this annual project, cutting-edge leaders will present the trend brought forward by NIRSA members. 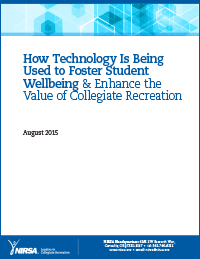 The results of this trend will be used to substantiate and promote collegiate recreation programs and services. Spotlight articles focused on the emerging trend of integrated wellness. This white paper presents popular types of fitness and health technology trends and explores issues related to these technologies. 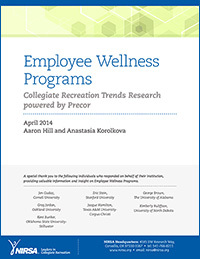 This white paper focuses on university employee wellness programs and their objectives, components, and outcomes.